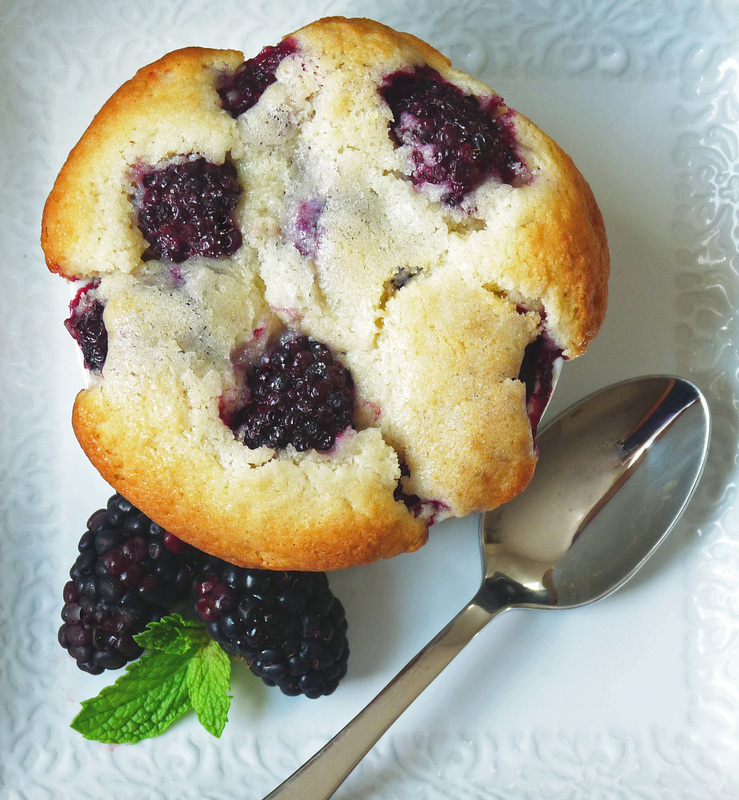 Blackberry cobbler is – HANDS DOWN – my favourite summer dessert. As soon as I spotted the world’s largest blackberries for sale at my local farmer’s market this week, I knew cobbler was in my near future. I used a recipe that – while in my family for decades – differs from others floating around the Internet these days. It’s actually a recipe for ‘cottage pudding’, featured in the 1918 edition of the AMAZING Fannie Farmer cookbook (if you don’t have one, visit your local bookstore ASAP!!). With the addition of fresh berries, the original Fannie Farmer recipe becomes the BEST cobbler you will ever taste! And by ‘taste’, I mean DEVOUR. While I divided the recipe into individual serving-size portions, it can just as easily be made in a shallow baking dish. Enjoy! Preheat oven to 400 degrees Fahrenheit (200 degrees Celsius). Grease four 6-ounce ramekins with butter. Rinse blackberries and pat dry. Set aside. In a medium-sized mixing bowl, sift flour, baking powder, salt and sugar. In a separate bowl, mix the egg, milk and melted butter. Stir gently into the flour mixture to combine. Place a layer of blackberries in the bottom of each ramekin. Spoon a layer of batter over the berries, repeating this process until the ramekin is full (I like to add several berries to the top of the final batter layer). Transfer ramekins to a rimmed baking sheet lined with aluminum foil. Bake in preheated oven for 20 to 25 minutes (cobbler topping should begin to brown lightly at the edges). Serve warm with vanilla ice cream.